I offer my reverence to the illustrious Bhugarbha Prabhu who was said to be born from the womb of the earth. He bestows love of Krishna; he takes pleasure in the service of Govinda Deva, is compassionate, simple and always joyful. Bhugarbha Gosvāmī’s initiating guru was Gadadhar Pandit Gosvāmī. He is therefore considered to be Gadadhar’s branch of the Chaitanya tree. Śrī Bhagavata Das, a fellow disciple of Śrīla Gadadhar Pandit Gosvāmī, was his close friend. Bhugarbha Gosvāmī and Bhagavata Das are branches of Gadadhar Pandit, both of whom went to live in Vrindavan. Lokanath Gosvāmī renounced the householder ashram in 1510 (1431 of the Śaka era) and came to meet Mahāprabhu in Nabadvīpa. Mahāprabhu immediately told him to go and live in Vrindavan, telling him that it was His own intention to take sannyas very shortly and go there Himself. Lokanath Gosvāmī started to cry when he imagined the Lord with His beautiful curly hair shorn and the distress the devotees would feel at His sannyas. When the Lord saw Lokanath Gosvāmī’s anxiety, He embraced him and consoled him with His mystical words and Lokanath Gosvāmī surrendered completely to Him. When Bhugarbha Gosvāmī saw how unhappy Lokanath Gosvāmī was, he decided to accompany him to Vrindavan. The two companions walked through Rajmahal, Tajpur, Purnia, Ayodhya, Lucknow and many holy places before finally arriving in Vraja. Though he had come to Vrindavan on Mahāprabhu’s order, Lokanath Gosvāmī constantly felt intense separation from the Lord, and shed copious tears in his desire to see Him again. When he received the news that Mahāprabhu had taken sannyas and gone to Puri and from there to the South on pilgrimage, Lokanath Gosvāmī hurried to Southern India in order to join Him. When he arrived in the South, he heard that Mahāprabhu was no longer there, but had gone to Vrindavan. Lokanath Gosvāmī immediately set off for Vrindavan, hoping to see the Lord there, but by the time he arrived, he heard that the Lord had gone to Prayag. Disappointed, but still determined to see the Lord, Lokanath Gosvāmī decided to set off again for Prayag. This time, however, Mahāprabhu appeared to him in a dream and told Lokanath Gosvāmī to stop moving about and remain in Vrindavan to perform his bhajana. Not long afterwards, Rupa Gosvāmī, Sanatan Gosvāmī, Gopal Bhatta Goswamis and others of the Lord’s associates started coming to live in Vraja. Their association brought Lokanath Gosvāmī immense joy. When Rupa Gosvāmī was getting old, he found it difficult to walk all the way to Govardhan to take darshan of Gopal. Seeing his intense desire, Gopal came to stay at the house of Vitthalesvara in Mathura, ostensibly out of fear of Muslim iconoclasts, but actually to show His mercy to Rupa Gosvāmī. The deity stayed there for a month, during which time Rupa Gosvāmī came for His darshan with Lokanath Gosvāmī and other Gaudiya Vaiṣṇavas. Lokanath Gosvāmī’s affection for Bhugarbha Gosvāmī was well known everywhere. They only had different bodies, in spirit they were one. Gopal Bhatta Gosvāmī was extremely compassionate. Bhugarbha Gosvāmī and Lokanath Gosvāmī are a goldmine of virtues. Lokanath Gosvāmī worshiped Radha and Krishna in deep separation, and with extreme renunciation. He was afraid of the slightest amount of fame. Thus he forbade Krishnadas Kaviraj Gosvāmī to write anything about him in the Chaitanya Charitamrita, with the result that nothing was written about him there other than his name. Sanatan Gosvāmī also mentioned his name in the maṅgalācaraṇa to the Hari-bhakti-vilāsa, as well as in his Vaiṣṇava-toṣaṇī commentary to the tenth canto of the Srimad Bhagavatam. 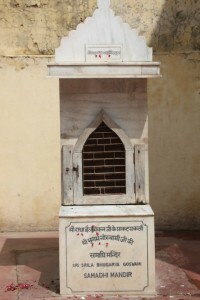 Pictured Bhugarbha Goswami’s samadhi in the courtyard of the Radha-Damodara temple in Vrindavan. Excerpt from “Sri Chaitanya: His Life and Associates” by Srila Bhakti Ballabh Tirtha Goswami Maharaj.